Interstate 79 intertwines with Big Sandy Creek along west from Newton to Amma in Roane County, West Virginia. Photo taken 06/24/12. Interstate 79 constitutes a two-state freeway that links Charleston, West Virginia with Pittsburgh and Erie, Pennsylvania. The freeway winds northeast from the West Virginia capital city along a mountainous route to Clarksburg, Fairmont and Morgantown, home of the University of West Virginia. Heading into the Commonwealth of Pennsylvania, I-79 swings westward toward Waynesburg and Washington for a brief overlap with Interstate 70. North from there, I-79 bends back to the east through Canonsburg, Bridgeville, Carnegie and other west Pittsburgh suburbs. The freeway bypasses the Steel City to the Ohio River at Corapolis and the Pennsylvania Turnpike at Cranberry Township. Beyond there from Harmony north toward Lake Erie, Interstate 79 travels a rural route to meet I-80 outside Mercer and I-90 at Mc Kean Township. 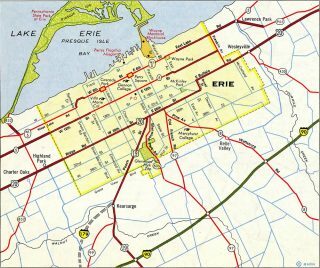 The northern terminus sees the freeway transition into Bayfront Parkway to the west of Downtown Erie. Interstate 79 largely follows U.S. 19 from Sutton, West Virginia north to Erie, Pennsylvania. The westward leg between Sutton and Charleston partially lines U.S. 119 from Clendenin to I-77 at Charleston. U.S. 119 also intermingles with the I-79 corridor through Morgantown. 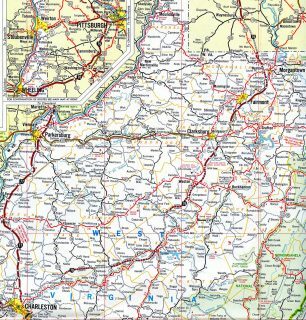 Interstate 79 was initially established by AASHTO on June 27, 1958 to run from Erie south to Pittsburgh in Pennsylvania.4 The route south to Charleston was added during the 1960s. 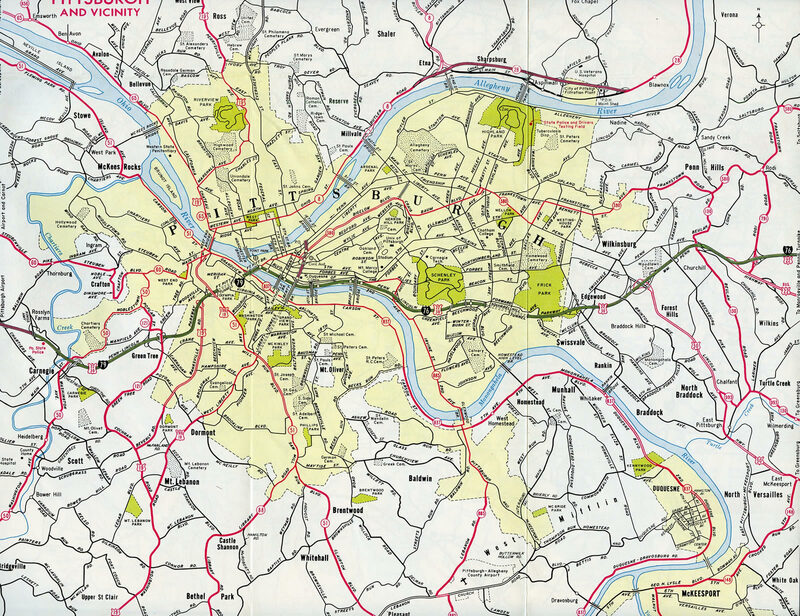 Through the Pittsburgh area, I-79 was planned to loop into the Steel City along modern day Interstate 279, and I-279 would have provided the bypass route via the current alignment of I-79 through the western suburbs. These alignments were proposed until at least 1968. Also in 1960 the Penn-Lincoln Parkway was designated as Interstate 70. It was changed to Interstate 76 by 1964 and eventually Interstate 376. 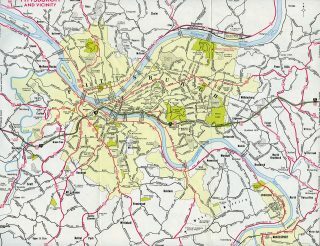 Changes to the main Interstates through Pittsburgh were made after it was determined that the through-traffic needs were more important. 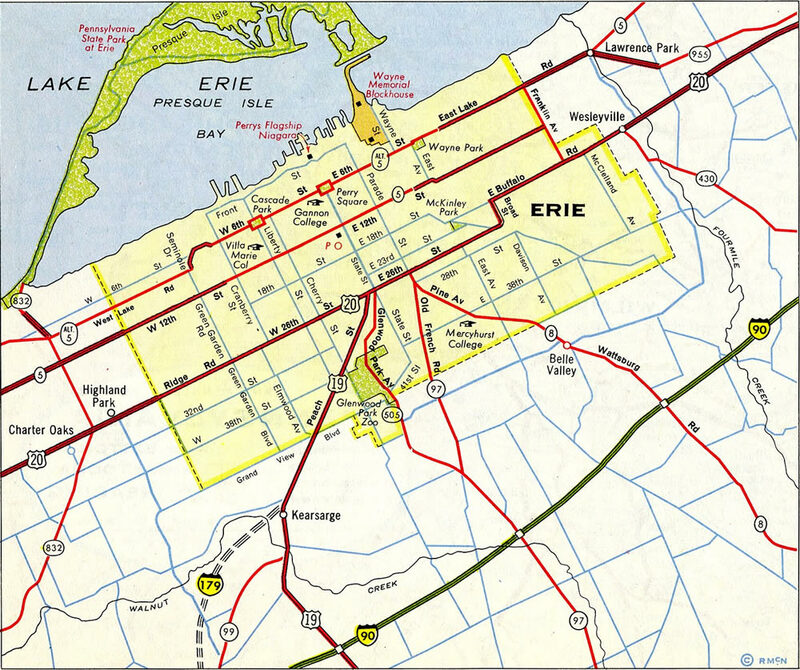 Approved by AASHO on November 12, 1958, the northernmost segment of Interstate 79 between Interstate 90 and the city of Erie was designated as Interstate 179.4 This changed by 1968, if not sooner. The only instance in the current Interstate system where a 2-digit route ends as a 3-digit branch of itself is in Dallas, Texas at the Interstate 45 terminus and transition into unsigned Interstate 345. Once Interstate 70 was relocated from Pittsburgh southward onto its current alignment between Washington and New Stanton, Pennsylvania, Penn-Lincoln Parkway was redesignated as Interstate 79 on the West portion and as the westernmost extent of Interstate 76 on the East portion. The Interstate 179 designation made it into the 1963 Rand McNally Road Atlas. All other editions showed the freeway leading into Erie as simply I-79. 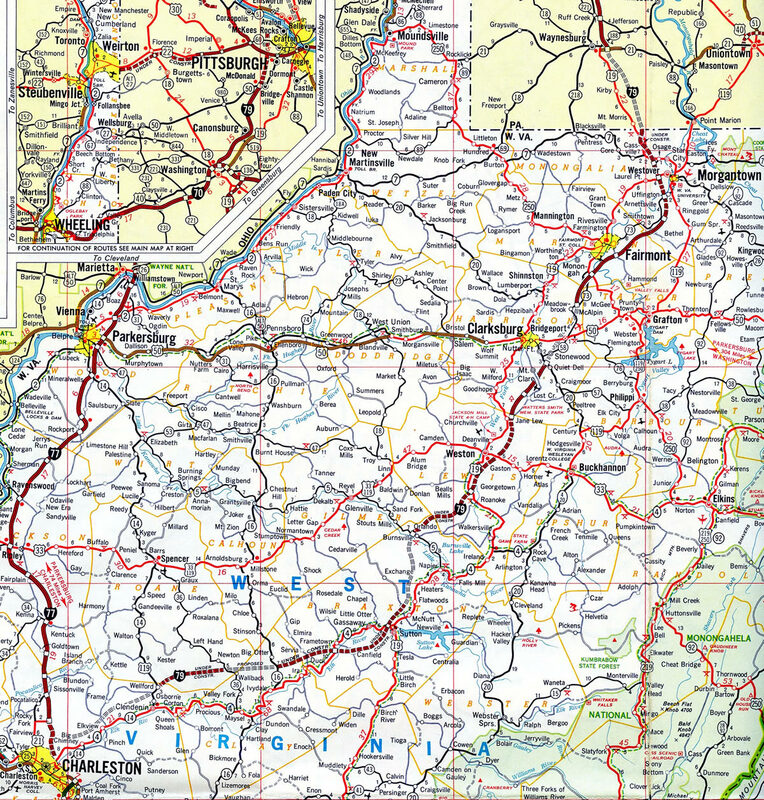 Two sections of Interstate 79 were completed in West Virginia by 1972: from Jane Lew to Quiet Dell and from McAlpin through the Fairmont area to a point south of Uffington and Morgantown. Interstate 79 ends 1.5 miles north of the exchange with U.S. 20 (26th Street). Photo taken 09/30/10. The final mile of I-79 north shifts eastward across Norfolk Southern, CSX and AMTRAK rail lines to PA 5 / PA 290 (12th Street) and Bayfront Parkway. Photo taken 09/30/10. Exit 183A departs I-79 for PA 5 & 290 (12th Street) east toward Downtown Erie. PA 290 begins here and overlays PA 5 east to the Bayfront Connector. The state route runs 8.8 miles east to I-90 at PA 430. Photo taken 09/30/10. Exit 183B follows onto Pennsylvania 5 (12th Street) west to Millcreek township and Erie International Airport (ERI). Photo taken 09/30/10. Stretching 415 miles from Springfield township, Pennsylvania to Albany, New York, MSR 5 represents the counterpart of U.S. 20 across Erie County and Upstate New York. Photo taken 09/30/10. The north end of Interstate 79 transitions into Bayfront Parkway beyond Exit 183B. Bayfront Parkway loops north from PA 5 around the Erie business district along Presque Isle Bay. Photo taken 09/30/10. Sign changes at the north end of I-79 for Exit 183A added Pennsylvania 290 east for 12th Street. Photo taken by Tim Kubat (04/06). Interstate 79 north at Exit 183 for Pennsylvania 5 (12th Street) prior to sign replacements using Clearview font. Photo taken by Tim Kubat (04/06). Interstate 79 (SR 79) northbound transitions into State Route 4034 (Bayfront Parkway) formally at milepost 182.4 underneath the 12th Street overpasses. Photo taken by Barb Bee (06/01). The first reassurance shield for Interstate 79 appears just beyond the freeway beginning from Bayfront Parkway at Lincoln Avenue. Photo taken 10/09/01. Interstate 79 runs along side the Elk River on a winding course from U.S. 119 (Pennsylvania Avenue) 1.3 miles to the left exit for I-77 north. Photo taken 06/24/12. An end shield for Interstate 79 stands along the southwest curving across the Elk River from Yeager Airport (CRW). Photo taken 06/24/12. A second diagrammatic sign precedes the three-wye interchange with Interstate 77. I-79 spans U.S. 119 (Pennsylvania Avenue) here. Photo taken 06/24/12. Interstate 79 concludes with two lanes continuing onto I-77 south to Downtown Charleston, where it merges with I-64 toward the West Virginia Turnpike. I-77 joins Charleston with Parkersburg and Cleveland, Ohio to the north. Photo taken 06/24/12. A two-lane left exit separates from Interstate 64 east for I-77 north to I-79 through a three-wye interchange northeast of Downtown Charleston. Photo taken 10/02/10. Leading away from I-64, Interstate 77 travels above an adjacent street grid along the parallel Elk River to Exit 102 with Westmoreland Road. Interstate 79 begins in one mile. Photo taken 09/29/10. Curving northeast, Interstate 77 splits with I-79 at Exit 104 in a half mile. Photo taken 09/29/10. Interstate 79 replaced portions of U.S. 119 and U.S. 19 as the main route from Charleston northeast to Clarksburg, Fairmont and Morgantown. Photo taken 09/29/10. Two lanes separate for both I-79 north toward Pittsburgh via Exit 104 the continuaton of I-77 north to Parkersburg, Cambridge and Canton, Ohio. Photo taken 09/29/10. The initial diagrammatic sign for Interstate 79 north appears 2.25 miles ahead of Exit 104. Photo taken 10/02/10. Interstate 77 navigates through a series of S-curves south to the three-wye interchange (Exit 104) with I-79 north. Photo taken 10/02/10. Left side ramps link I-77 north with I-79 north and from I-79 south to I-77 north due to area topography. Photo taken 10/02/10. Interstate 77 southbound reaches the left exit for Interstate 79 north toward Clarksburg and Morgantown. Photo taken 10/02/10. The first confirming marker for I-79 stands ahead of the left side on-ramp from I-77 south to the freeway northbound. 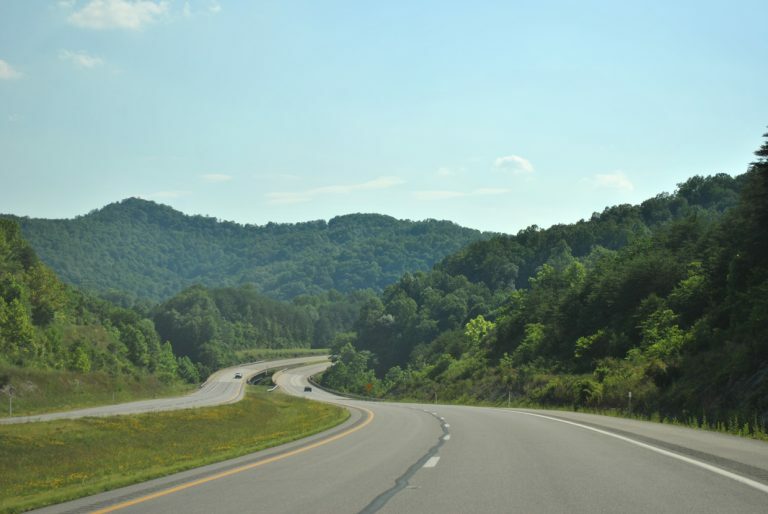 I-79 traverses mountainous terrain on the 119-mile drive to Clarksburg. Photo taken 10/02/10. Kitsko, Jeff. “Remaining ramps of the Cranberry Connector Opening Right Now.” Online posting, misc.transport.road, October 15, 2003. Page updated October 5, 2018.